Whisker Graphics: Oh, my aching back... No more! I started Whisker Graphics last June on a shoestring budget. That budget has not changed. My "studio" is our 4th bedroom. It's not fancy, nor beautiful. My computer workspace is a "desk" (a plastic folding cafeteria table from Costco, ugly but roomy) and my laptop. My laptop sat too low for me. I constantly hunched over to look at the screen and that made my back ache in the worst way. I wasn't sure how to remedy this. 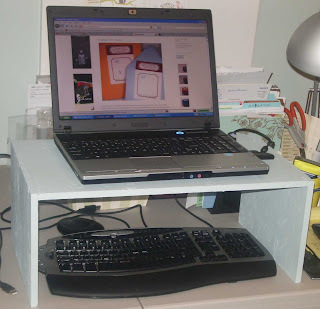 Then, I saw a photo of Marty Stewart in her office and she had this nifty stand for her laptop. "I want one of those," I thought to myself. With my budget in mind, I set my spending limit at $0. First I asked friends if they had an old keyboard I could have. They did. 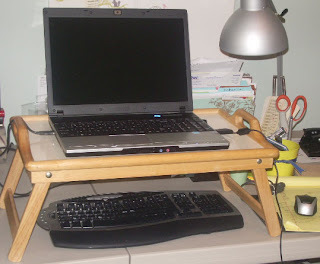 Then I did a trial run with a folding breakfast tray to make sure the height and keyboard would work. (That ugly legal pad to the right is my mouse pad.) The LOML made the stand out of some scrap plywood we had in the garage. Not up to Martha's standards for sure, but then again, Martha's budget is bigger. 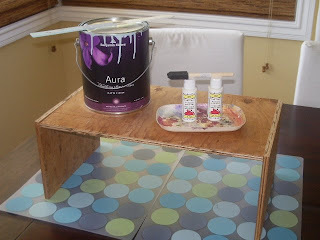 I had some white craft paint (bought when it was on sale 2 for $1), a foam brush (bought when on sale 10 for $1) and my trusy paint tray (an old frozen dinner plastic tray) and leftover paint from our bathroom. 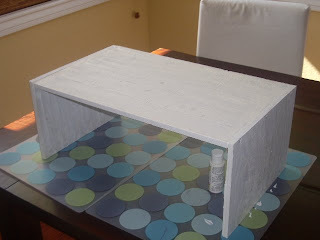 A coat of the white craft paint first to act as primer. Then coat of Gossamer Blue paint from Benjamin Moore and my backsaver was finished. Both my back and my budget are satisfied! Great minds think alike! 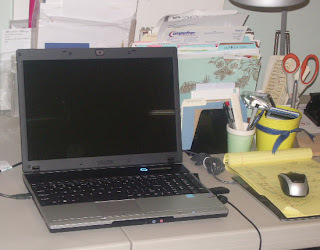 I went through the same thing a few months back...a cordless mouse and external keyboard, plus putting the laptop higher AND farther away made a huge difference. Mine sits in an adorable drop-leaf desk I got at RWAP! congrats on the updated work station -- looks great! i came across your blog this week after hearing about your free folder template and love the blog and etsy shop! keep up the great work. The laptop at my house has moved up in life too, since I read your post. Thanks for the tip! I would've never thought of that. I just got a laptop a couple of weeks ago, it does take some ergonomic getting use to for sure!